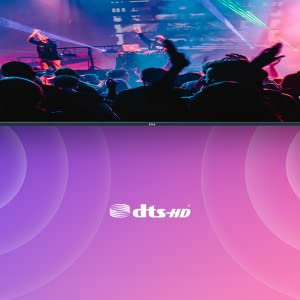 Built to Be Sturdy, Made for EntertainmentBrowse through features like DTS-HD sound, 7,00,000+ hours of content on PatchWall, in-built in Chromecast, personalised recommendations, Google Voice Search and much more. This television by Mi also allows you to accesses almost everything on the internet without any hassles. With multiple ports, you will be able to connect numerous entertainment devices. Watch your favourite movies, TV shows and much more with the 49-inch Mi LED TV 4A PRO. You will also be able to control your entertainment with your voice as the voice enabled remote gives you access to Google Voice Search. 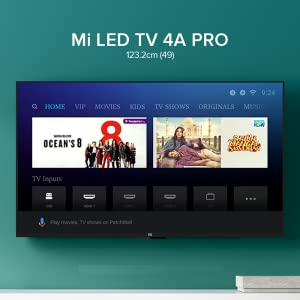 Affordable, Stylish and Manufactured for the Best PerformanceWhether you want to mount the TV on the wall or sit it on the table, the Mi LED TV 4A PRO gives you the best performance as it comes with a 64-bit quad-core processor, 2GB RAM + 8GB storage, Bluetooth and Wi-Fi connectivity. With great looks, this TV is gives you access to great entertainment in the comfort of your living room. 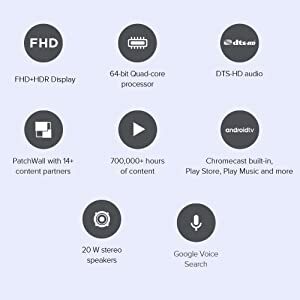 Full HD+HDR display, cinematic quality sound, multiple ports, leading performance, 700,000 hours of content on PatchWall. Delivers exceptional detail, colour and contrast. Explore every detail in brilliant clarity, along with life like colours and enhanced brightness. 20W Stereo speakers. Experience richer, deeper sound. A revolutionary TV experience. Your favourite content right on your homepage with 700,000+ hours of content. 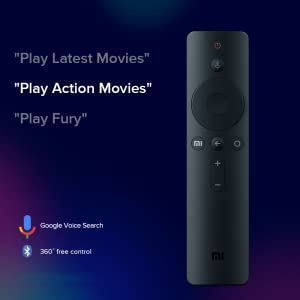 Mi remote now comes with a dedicated voice button. Search for your favourite content right from the home page. With the TV guide available on MI TVs, all your favourite cable/DTH content is easily discoverable. Mi remote comes with a 360° free control. You can enjoy Google voice in English. 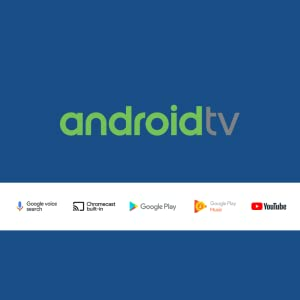 Android TV offers thousands of movies, shows and games from Google Play, Youtube and your favourite apps. With Chromecase built-in, you can easily cast movies, shows and photos from your Android or iOS device. 1. No Chrome browser installed. 2. Amazon prime video and netflix apps can not be installed. MI 49″ TV got delivered on Friday. I waited for two days, to open the TV in front of installation team today. 1) Google voice assistant is working for me,like 8/8 times with 100% accuracy. I have a video ready but somehow not able to upload here. Will keep trying to upload though. 2) the switching between patchwall and Android is smooth. 3) YouTube works smoothly as well, with very little initial processing. After that, I saw no buffering or disconnection while playing the video. 4) Sound is amazing. The video I am trying to upload will show the google voice assistant, YouTube and sound of the TV. 5) keyboard typing initially for sign in and all purposes is smooth enough. 6) bluetooth pairing is smooth. Hdmi worked as well. 7) chromecast is an amazing and super easy feature. Worked well with YouTube. Gave little issues while playing videos in google photos apps though. 8) Hotsar app was pre installed. Worked well as well. 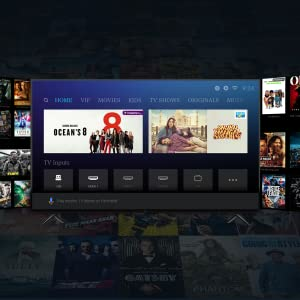 1) Though the patchwall is easy to navigate, for some of the movies or shows, you need to install an external app or plugin and some content which is shown is not available. Eros, for example, was showing a movie on patchwall which after logging in was not found. So, an update is definitely required. 2) normal TV viewing experience with a normal cable SD connection is not very pleasant. Maybe after upgrading to a d2h connection, it gets better. 3) Amazon prime is not provided. 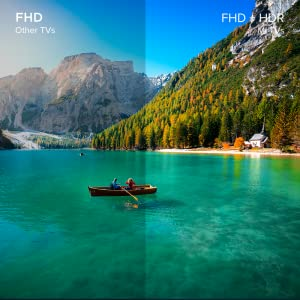 Though I know: MI has announced it will be available soon.All in all, if you have a good d2h connection,preferably HD, you have a very pleasant TV viewing experience and also, loads of features at your fingertips which works great and loads of patchwall content. It is surely value for money, just will see for many years it sustains and how MI gives the service. You can request for any feature to be tested here. I can try at home. Bought it during the flash sale, Here are my Views after 24 hour. -Amazon Prime and Jio Cinema works fine. -Chrome casting works fine with OP3T and Moto G4 Plus. I was able to use Android TV app to control Mi TV. Need to test HDMI Connectivity, Will post later. 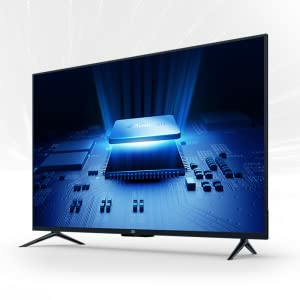 I was about to buy the 55inch MI TV few days ago and this one was announced. I guess it was worth the wait. At the listed price of 30K this is worth every rupee, though I got it at 27k with all discounts & cashbacks. Google Voice Search on remote is the best feature. It works seamlessly. TV comes with patchwall and Android pre installed. Chromecast comes along free(built in). Bluetooth works nicely if you are looking at adding external speakers ora sound bar. Youtube, Sonyliv, Hungama, voot etc are pre installed. Since this is a full Android OS, you get access to Google play which can be used to install other compatible applications. Don’t assume all apps that you see on phone can be installed. 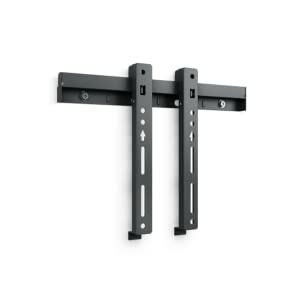 It’s just the ones made for tv which can be installed. Finally – you can expect regular OS updates just like on your phone. The moment I switched on the TV, I got an update. The TV is a little heavy and thicker than MI TV 4. Bezel is a little wider. Infact this tv is thicker than my 9 year old Samsung LED. But I wouldn’t complain – it hardly matters once fixed to the wall. The box doesn’t come with wall mount, which had to be bought seperately, but you can use the stand which comes in the box. Finally – installation experience – not good so far. It’s over 24 hours since the schedule and I still don’t have anyone visiting or calling me. Complaints to customer care haven’t been helpful. Will update on it later. Overall – I’d reiterate – for the price, it’s a steal. I’m guessing the price will be hiked sooner than later. Buy it quickly. Good product as compared to the price. Bought it on 9th Oct, 9:15pm and got it delivered on 10th Oct, 6:30pm in Bangalore. Good picture and video quality. Able to play 4k content from YouTube without any lag. Awesome viewing experience if you are watching from at least 8 ft distance. Very good sound quality at this price, one shouldn’t expect Bose quality of sound where only the speaker won’t come for this price. Nice remote, light weight with only 12 buttons and looks cute. Google voice assistant works perfectly. Used 1Tb HDD to view videos and it worked very smooth. Works good with Chromecast from mobile device and to any wireless enabled or Bluetooth enabled device. The panel and bazel quality is poor, the screen moves with touch of finger. Connectivity issue with wifi, it’s inconsistent. Could have provided more USB ports. Preinstalled apps lack the most popular ones for TV, i.e. Netflix, Prime Video.Anyway can hope for Mi to update all s/w related complaints soon. Bottom line, it’s worth the money spent. But Mi need to do a lot of improvements to make it a success.